This is one of the most obnoxious but fun cars on the market today. Let me explain why. 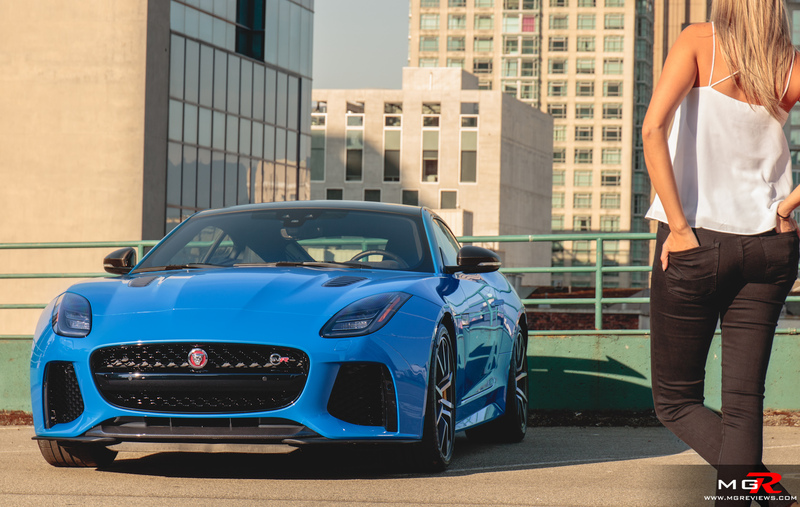 Engine – A 5.0L supercharged V8 resides under the long hood of the F-Type SVR. It develops 575hp and 516 lb-ft of torque. Jaguar claims a 0-100km/h time of 3.7 seconds however I didn’t have a way of testing that but from behind the steering wheel, it feels very quick when accelerating. Because superchargers provide instant power, there is no delay from the time you stab the accelerator pedal to the time you get pinned to the back of the seat. Power is immediate and is available throughout the rpm range. 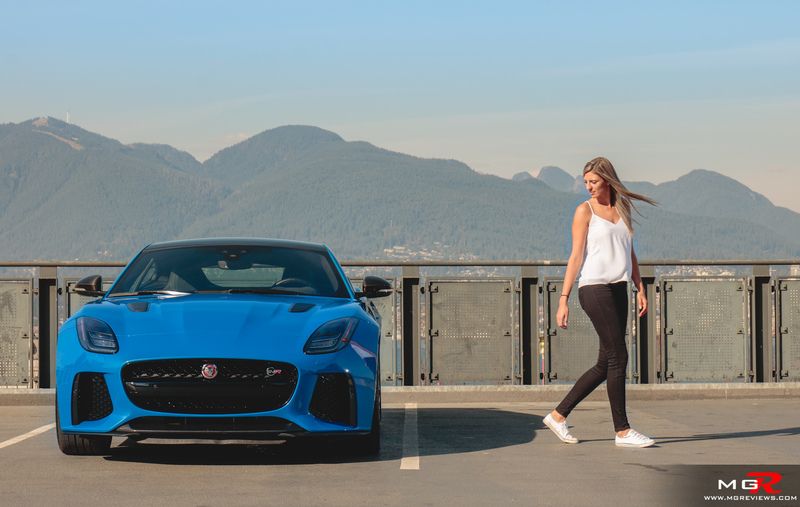 Unlike the model that it replaces, the XKR-S, the F-Type SVR is only available with all-wheel-drive so you don’t have to worry too much when accelerating from a stop about the tires losing traction from the engine’s power. As far as big and powerful engines go, this one is surprisingly economical. 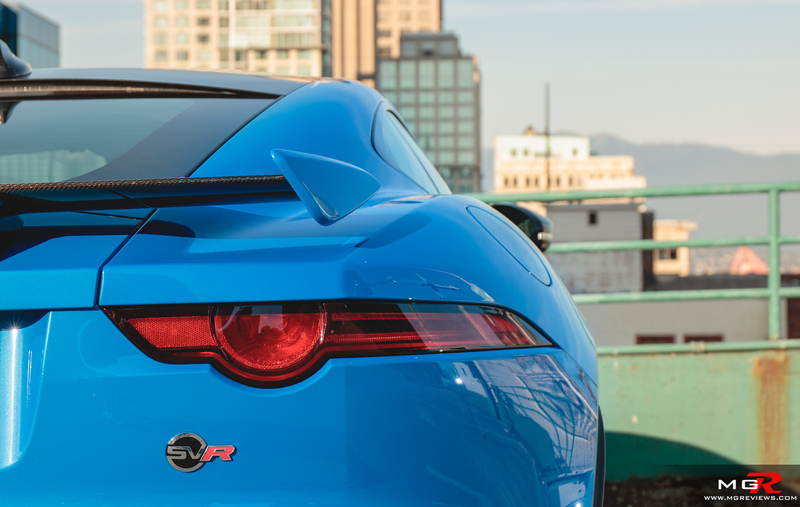 Jaguar claims a fuel economy figure of 10.4 L/100km on a highway and 15.6 L/100km in a city. In the week I had the car, I managed an average of 12.5 L/100km on a mostly highway drive cycle… with quite a few twisty mountain roads in the afternoons after work. Not bad for 575hp. What’s really not bad with this engine, are the noises that it makes. More on that in the NVH part of the review. 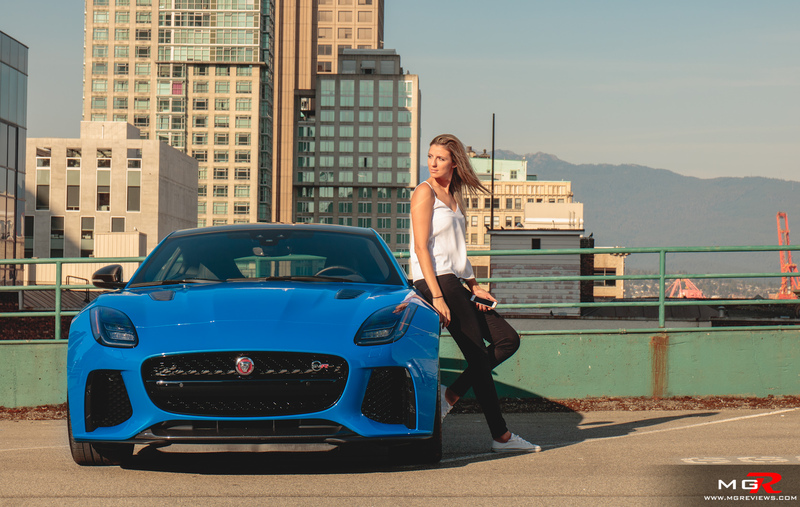 Transmission – An 8-speed ZF automatic is the only transmission offered with the Jaguar F-Type SVR. in normal drive mode, it is smooth both on upshifts and downshifts. Sometimes it starts in second gear for a gentler take off from a stop. In Dynamic mode with the gear selector in Sport, the shifts become a bit harsher but also faster. Unfortunately the transmission is not dual-clutch fast which I think would let it down a bit around a race track when facing off against its main rival, the Porsche 911. 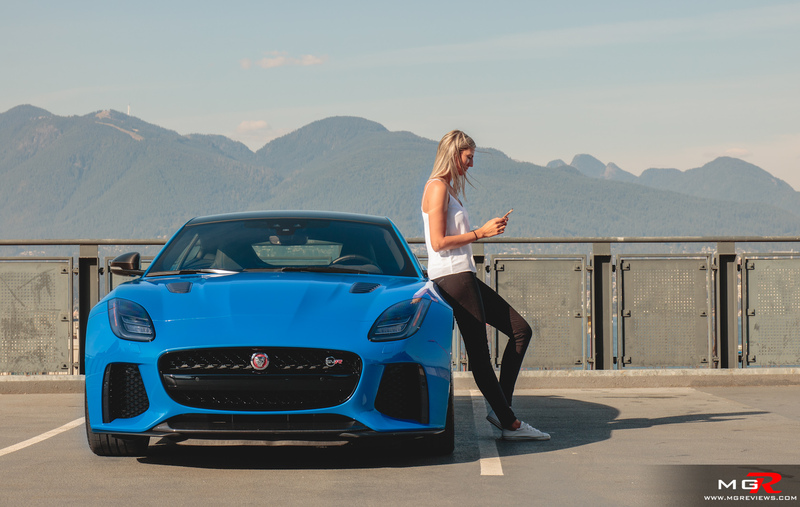 Braking – This particular Jaguar has the optional carbon ceramic brakes option which will set you back just over $13,000 CAD, granted they do include the 20” wheels as shown. Braking technology has come a long way and these carbon ceramic brakes bring the 1,700 kg Jag to a stop very quickly. The only thing is, you need to get some heat into them before aggressively using them. In normal city traffic, they are sensitive and require little brake pedal actuation to stop the car. But when driving enthusiastically or around a race track, they need to be warmed up before they can show their full potential. 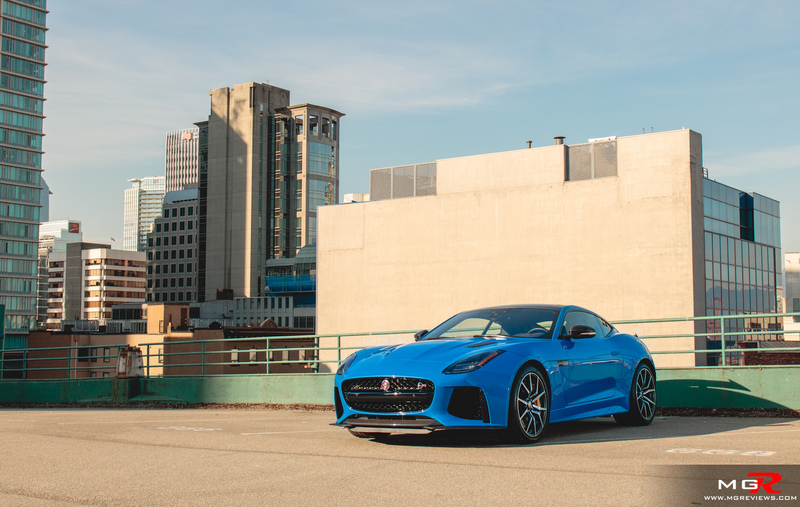 Handling – Jaguar wanted the F-Type SVR to be less of a luxury GT car and more of a sports car and it reflects in the way it goes around corners. The wide tires provide a huge amount of grip and you have to be going very, very fast before you reach the limits of adhesion. The steering is precise and has a good weight and feel behind it. Not too heavy but not too light. 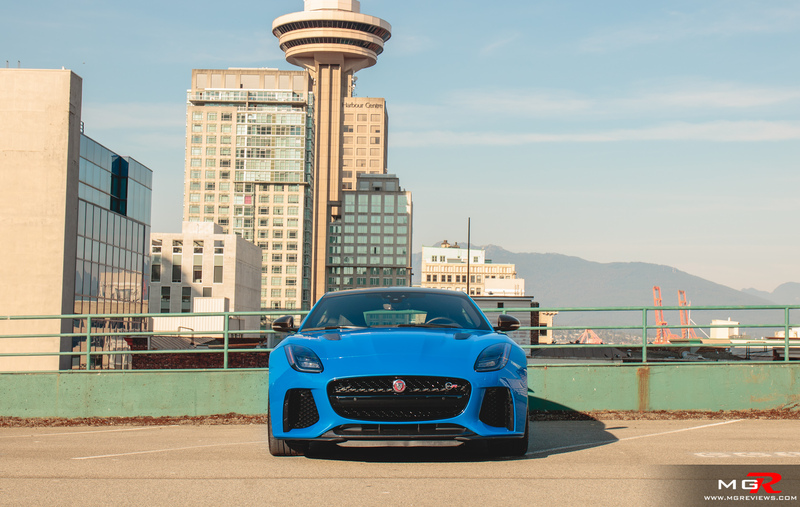 Torque vectoring also aids in how well the Jaguar SVR goes around corners in addition to the e-differential to make sure the power gets sent to the wheel with the most grip. In all the big cat feels very planted around corners and gives you a lot of confidence to go fast. 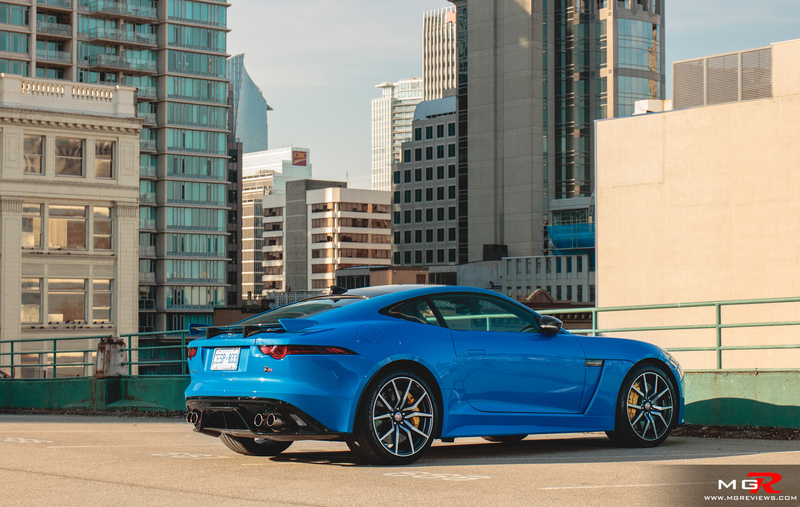 What’s not so good about the way the F-Type SVR handles is how much input you have to give when just going into a straight line on a highway. The wide tires are constantly moving around the road as they go on and off the crown of the road requiring you to make many little corrections when on a highway. 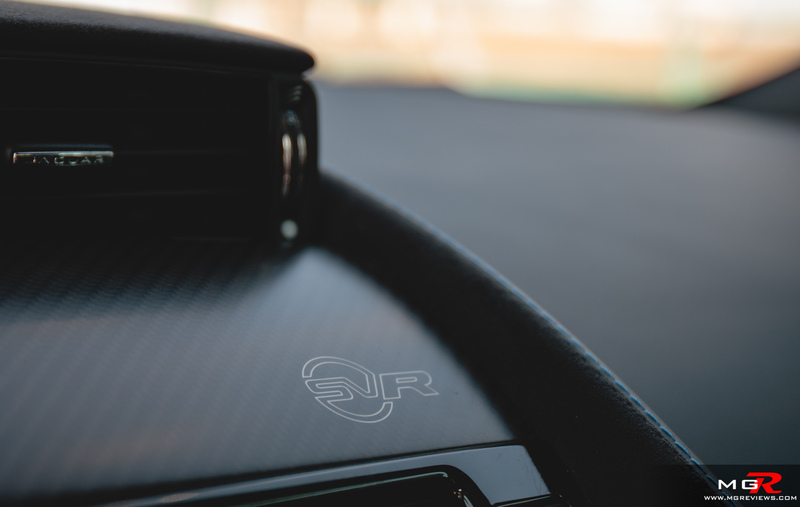 Ride Comfort – The SVR comes equipped with adaptive suspension but even so, it is a stiff ride. On freshly paved roads, the ride is relatively comfortable for a sports car of this nature. Drive over cracked and uneven city roads, and the ride becomes almost unbearable. The seats provide a lot of lateral support when you’re going around corners and an adequate amount of comfort on longer journeys. At 6’5”, I have just enough room with the seat pushed as far back as possible. Headroom is plentiful and leg room is ok. 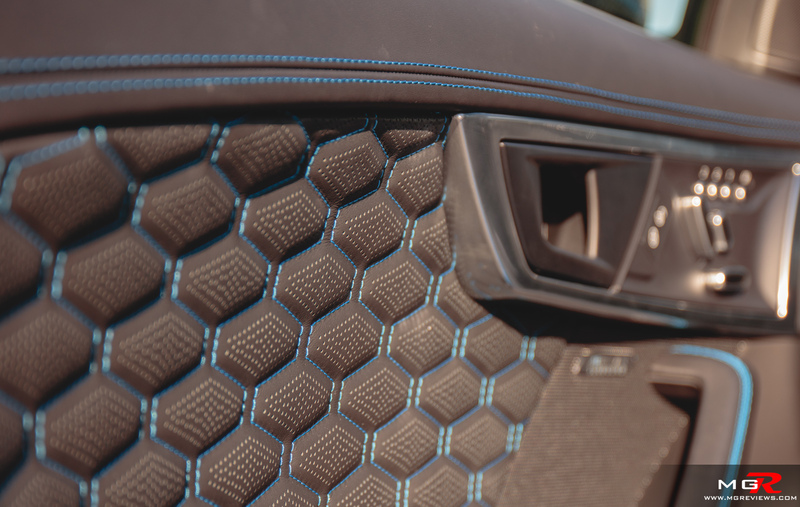 Noise, Vibration, & Harshness – Now onto why this car is obnoxious. It is the loudest street legal production car ever. Whether the active exhaust is on or off, the engine produces a lot of noise. Thankfully, it’s a very good noise. Accelerating, you get the classic European V8 machine gun rumble with a hint of supercharger whine at the top end. Decelerating, it pops and crackles like no tomorrow. And here’s a tip. 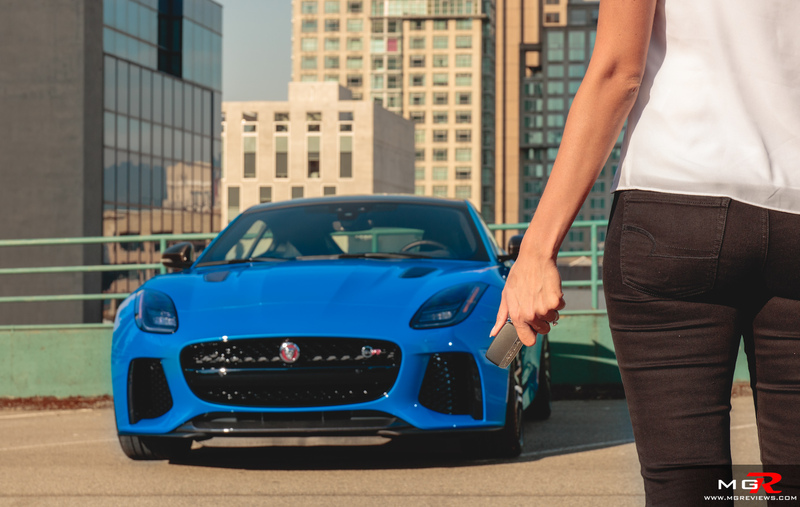 If you want your F-Type SVR to crackle and pop and get into trouble with the police, keep the rpms around 4,000 while decelerating and just lightly tap the throttle. It will always do this no matter what and I’m sure that this titanium exhaust can be heard from 2 or 3 city blocks away. But if you’re just cruising on a highway and keeping the engine below 2,000 rpms, the predominant noise in the cabin is that of the tires. It’s not annoyingly loud but you do notice it. Squeaks and rattles are non-existent in the demo vehicle I had but if they do manifest, the exhaust will drown out any other noises. 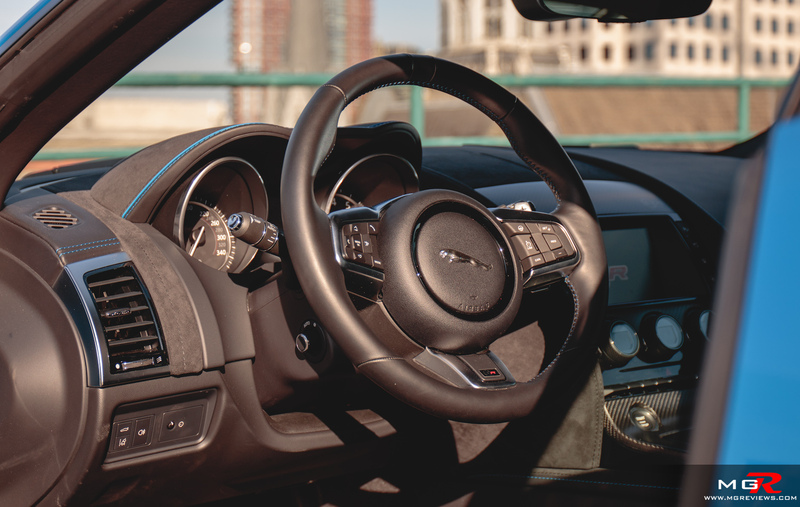 Interior Design – The interior is traditional Jag but with a touch of modernity. 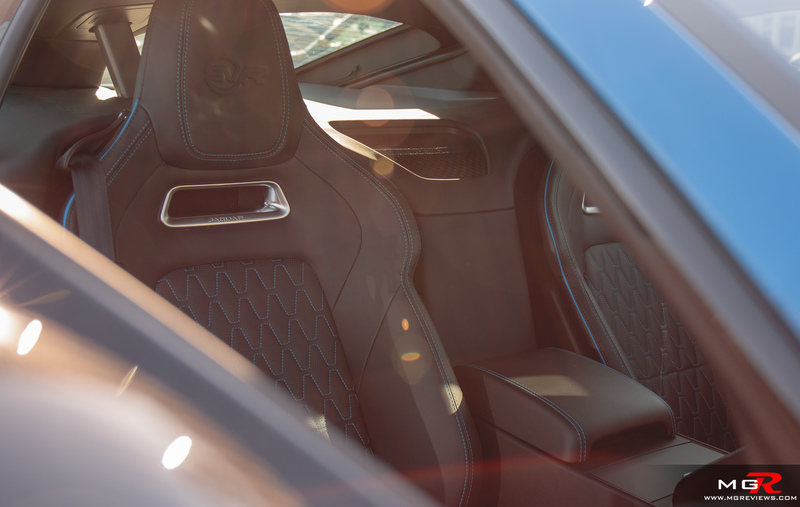 Quilted leather with contrasting stitching cover the seats and door panels while suede covers the majority of the dashboard and headliner. 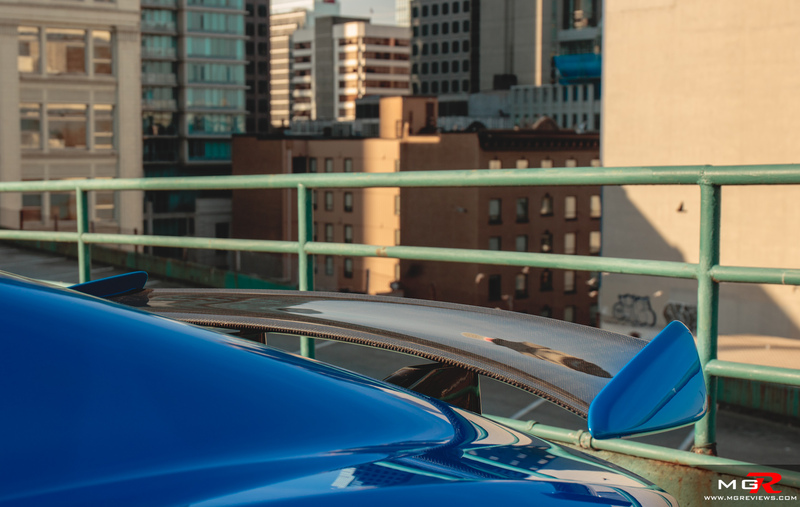 This particular SVR comes with the optional panoramic roof but a carbon fiber roof can be optioned. 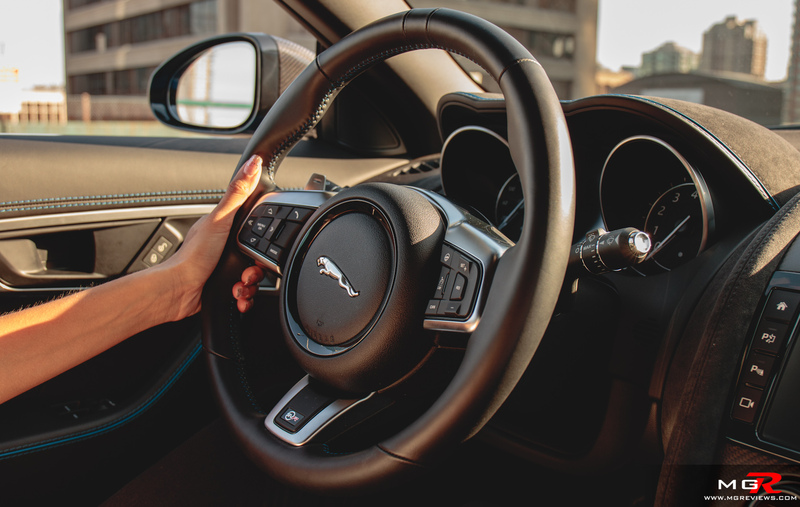 The center of the dash is similar to that of the E-Pace with most functions being controlled through the touchscreen and 3 dials below it for climate and heated & ventilated seat controls. It is a nice place to be in but seeing out is a bit more difficult. Rearward visibility is ok but the blind zone on the passenger side is big due to the b-pillar. Thankfully, blind spot sensors are available but they’re not a standard feature. 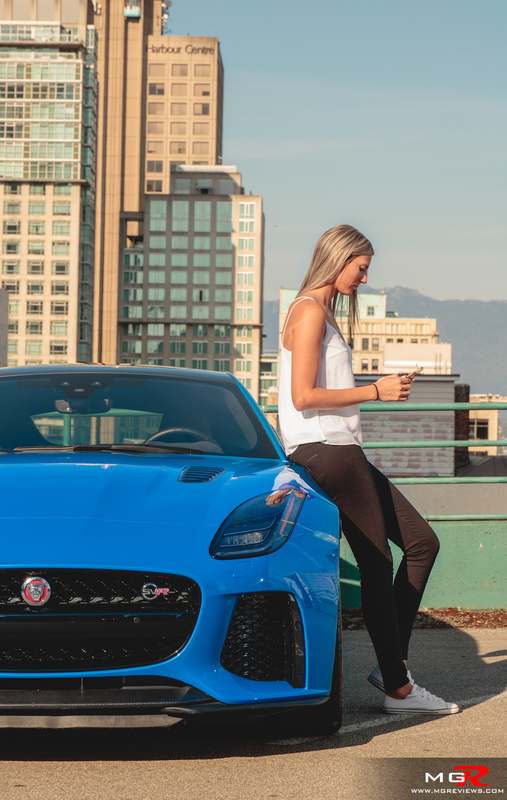 Gadgets – The Jaguar F-Type comes with some features that are standard like forward collision alert, lane departure warning, and navigation. 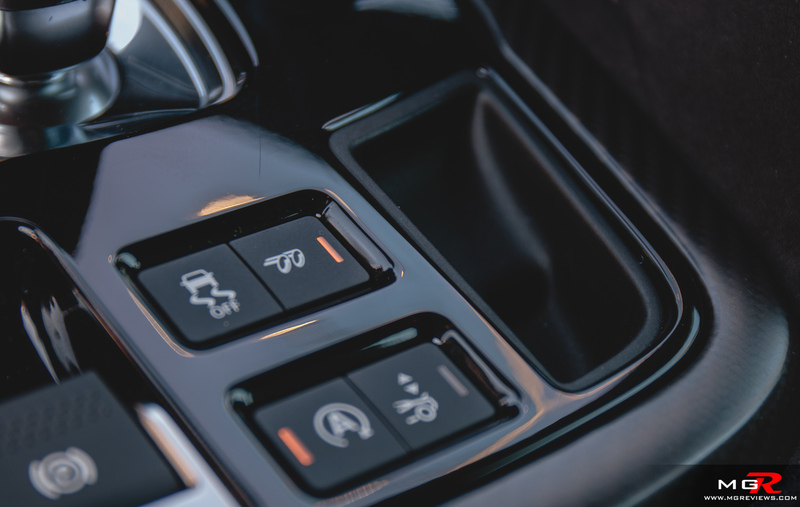 But other features like blind spot sensors and heated seats are options while features such as a 360 degree camera system and adaptive cruise control are not available. So for a car that starts at $140,500 CAD, it is not as well equipped as a car that costs ¼ of the price. Even when it’s fully equipped like this one at $170,000 CAD, it’s still missing some features that would be nice to have. Exterior Design – Now onto the second reason why I think this car is obnoxious. Just look at it. It’s screaming for attention. 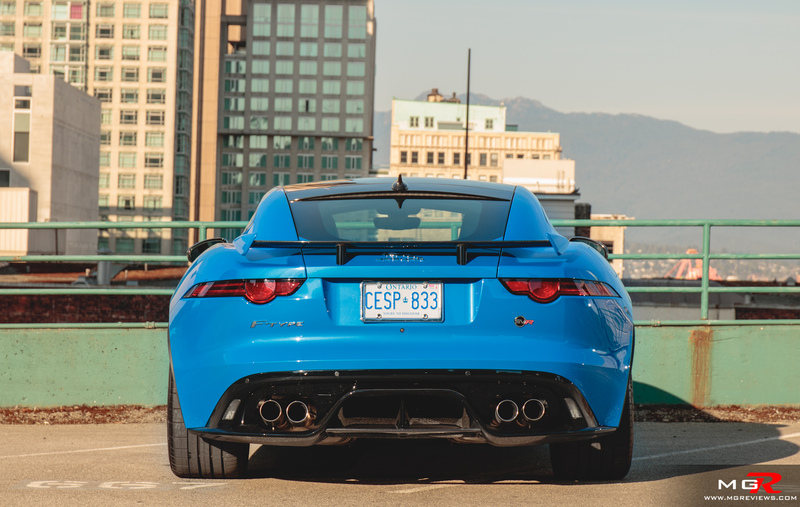 Between the extra loud exhaust, blue paint, yellow calipers, and rear wing, it turns heads wherever it goes. Oh, I like the way it looks. But if you’re the type that likes to be subtle and not show off, this colour combination attracts just as much attention as a Lamborghini Huracan would. For $170,000 CAD as this one is equipped, you’re paying a lot for a luxury sports car. 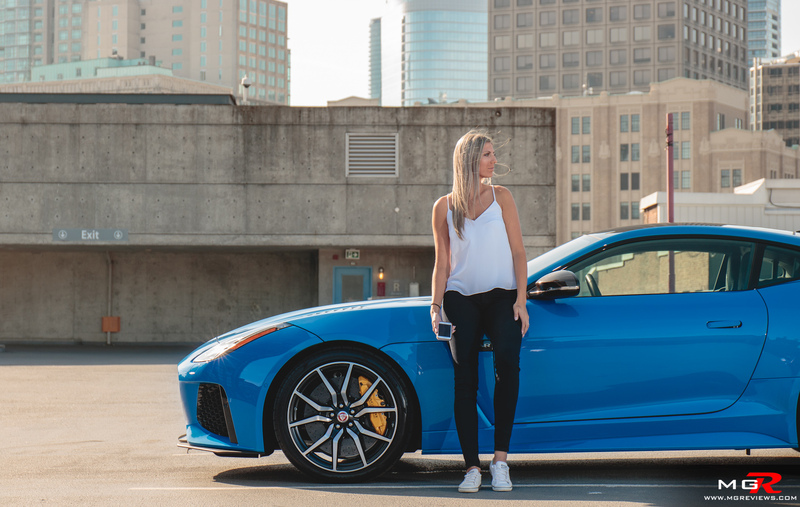 If you’re interested in setting nothing but lap times, then the less expensive (albeit base version) Porsche 911 GT3 and Corvette Z06 will do circles around the Jaguar F-Type SVR. 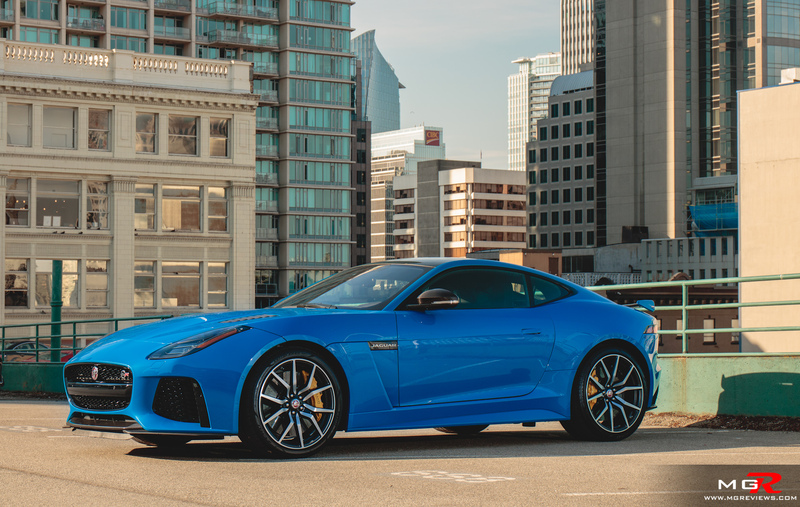 But the Jaguar SVR is not about setting lap records. It’s more about enjoying the driving experience around a twisty mountain road. It’s about taking the Mrs. out for a dinner on a weekend. It’s about having a smile on your face. 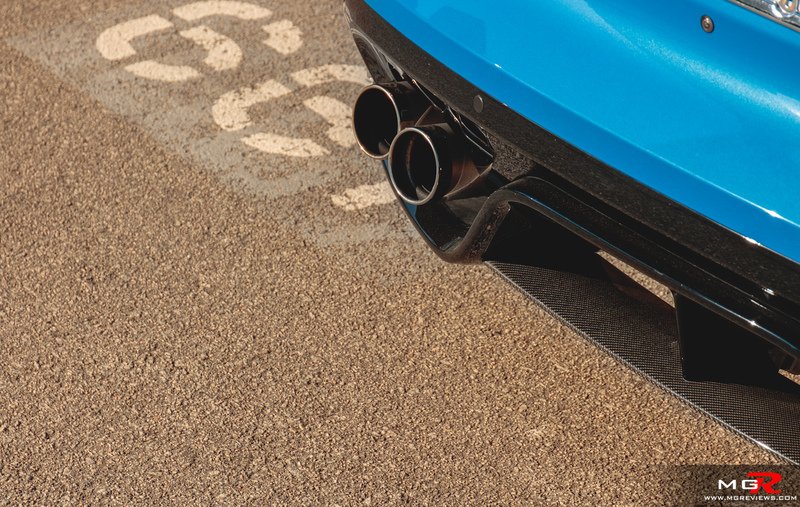 And that exhaust… it will always put a smile on your face.